Some pictures of adult birds, actually the first on my site (!) since they are not easy to capture on photo over here in the NE part of the Netherlands (same goes for adult Yellow-legged Gulls). 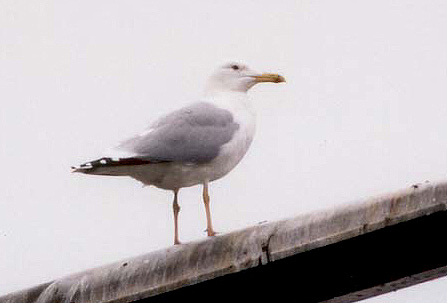 This bird was photographed in Helmond on 1 December 2001. Note the rather thin yellow legs, dark eye, rounded head and long slim bill with tapering end. Some adult CG can show deep-yellow legs rather than the well-known pinkish or 'colourless' yellow legs.